Learn how to cleanse crystals with a Copper Pyramid. 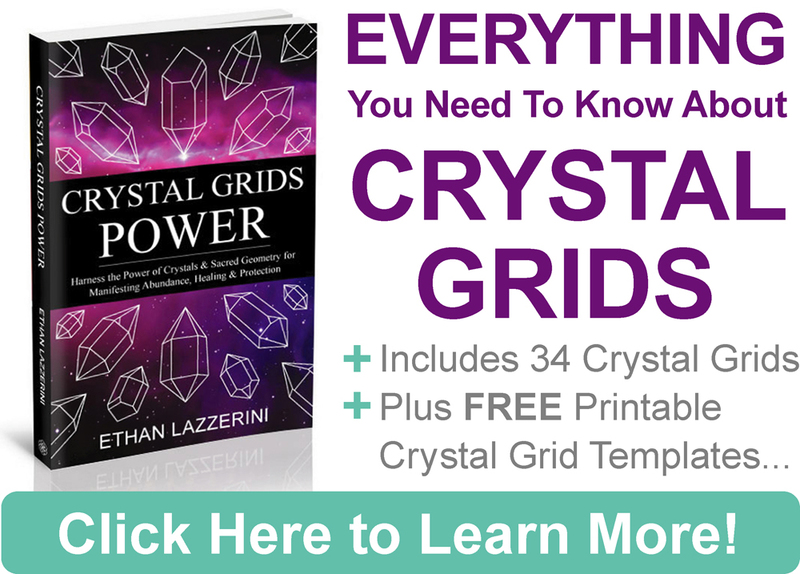 Discover the benefits of Pyramid Power on your healing crystals and Crystal Grids. Learn how to align a pyramid for cleansing and charging. I first heard about the power of pyramids back in the 90’s. The first books on the subject appeared in the early 70’s, such as Pyramid Power by Dr Patrick Flanagan. There is a lot of research, studies and experiments in these books and online to explore if you want to. 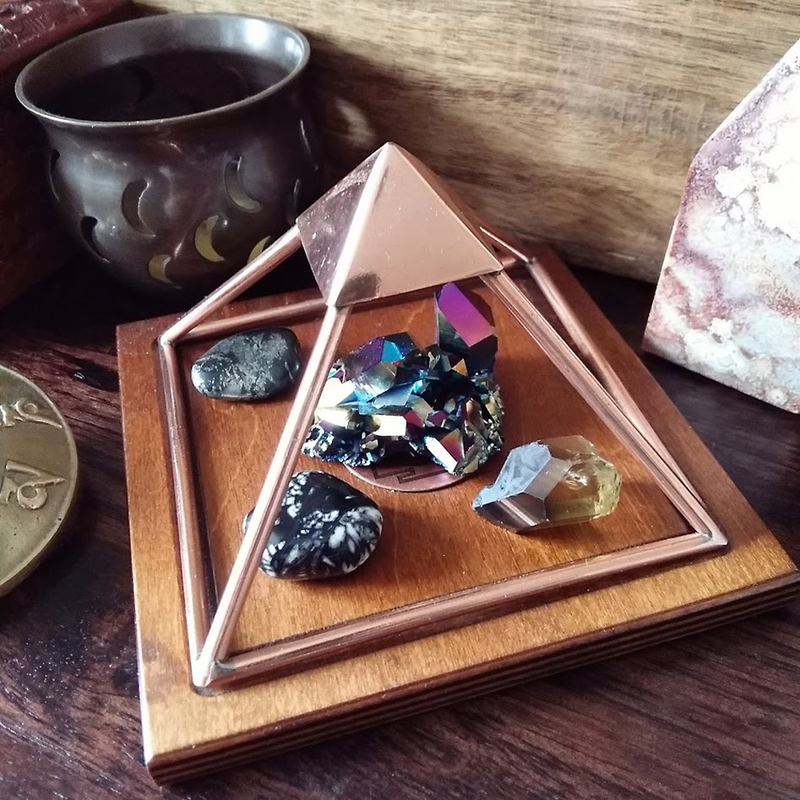 I purchased my first Copper Pyramid about 10 years ago from someone who was making and selling them on Ebay. I have been using them ever since. They are three dimensional pyramid frames, mostly made of copper bars or pipes. They may be made from other metals such as Aluminium and Titanium but usually they are mixed with or coated with Gold. Some Copper Pyramids are also Gold Plated. Copper and Gold are very powerful electrical conductors which is why they are used. They can be small or large enough to sit in and meditate. I am just talking about the smaller sizes used to place items in like crystals. Most of these are made to the exact angles and proportions of the Great Pyramid of Giza in Egypt. There are also more pointed ones based on the Nubian Pyramids which also use very specific angles. Different makers make them differently, some have a cap (Capstone) at the top or a hook to hang things. Others may have other geometric forms or crystals attached and I have seen some come with an additional platform on the top. Some come in kit form, and need to be assembled. These devices are used for a wide range of things such as boosting the potency and energy of fruit, water and vitamins. This is called ‘pyramid charging’ and is believed to increase the power of things placed inside them. Pyramids also cleanse and balance energies, which is why I use them to cleanse my crystals. Many people feel that this also increases the energy and effectiveness of their healing crystals. As I explained in my book Crystal Grids Power, you can also place a Copper Pyramid over a Crystal Grid. 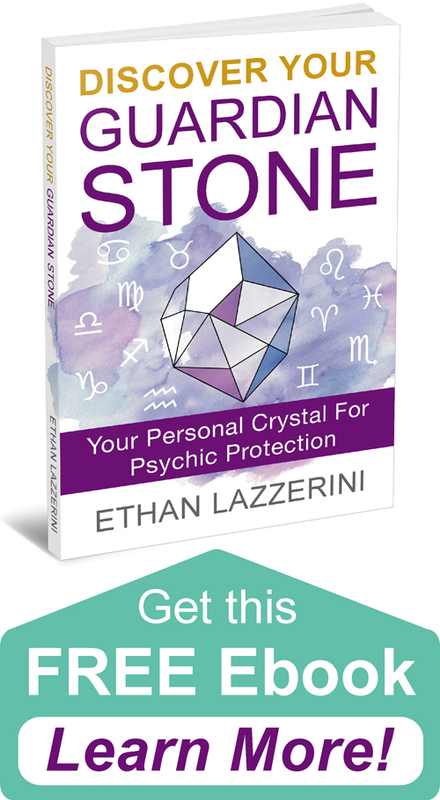 Not only will it keep the crystals cleansed and protected, it will greatly amplify the effects of the Crystal Grid for healing or manifesting. The other benefit of using a pyramid for cleansing is they are so easy to use. You do not need to burn any incense, make any noise or actively clear things like many other methods. The Pyramid does all the work for you, so you can cleanse things while you sleep! Despite the studies and tests people do at home, Pyramid Power is not likely to be fully accepted by mainstream science anytime soon. In the metaphysical community they are becoming and more and more popular. Pyramids are a very important structure in Sacred Geometry. They consist of four triangles with a square base. The use of metals like Copper and Gold is to conduct energy. The specific angles and proportions of the Great Pyramid relate to the Planet and the Moon, so harmonise with the natural cycles and connect with the Earth’s magnetic field, energy centres and Ley Lines. These are all environments that minerals and crystals feel at home in. Pyramids are also said to be natural ionisers. When properly aligned with the Earth’s magnetic field a pyramid amplifies energies, transmutes them and directs them out through the tip. Where To Get a Copper Pyramid? Copper is not cheap these days (either is Gold…) and due to the work involved in making these devices, pyramids can be expensive. If you can weld you could make one yourself, but it needs to be very carefully made and measured. It does not look an easy job. It can be cheaper to buy one made by someone else like the ones on Etsy. Be sure to check proportions are done properly and remember that if the Copper pipes or bars are not specially coated or gold plated they will turn brown over time. There are a few options for you in my Amazon Shop in the Crystal Tools section. Alternatively, you could get a Meru Pyramid from their website or somewhere that sells them like Shamans Crystal. 1. Align one of the sides of your Pyramid to magnetic North with a compass (see diagram above). 2. Place your crystals inside the pyramid in the middle area, under the point or cap. 3. Leave them there for at least an hour or overnight to also boost their energies. Have you used Copper Pyramids before? I would love to hear from you in the comments below (Please keep any questions you have on topic if you want a response). I put my crystals in a copper mug to cleanse…you think that will work? I saw this link quite some time ago and was drawn to the stunning Meru pyramid. Sadly, shipping to Australia was quite substantial and I decided against it. Much to my delight, I saw them at the local Body Mind Soul Festival last weekend and was very delighted to be able to bring one home with me. It’s set up in my meditation room now. Gladly I’ve reread your post and will align to North. What is the significance of this step ? The Great Pyramid at Giza and other large ones around the world align with North. This taps them into the natural energies of the planet and the magnetic field. Yes I think it is okay to keep crystals inside a Pyramid. Just make sure that if it is by the bed that it does not disturb your sleep. Pyramids generate energy. Hi, I am looking to buy a copper pyramid. And I was just wondering how a gold anodized titanium aluminum pyramid would work if it needs to be copper? And which do you think is better…. A pyramid that lays flat or a pyramid that is raised for more vibration? By the way, I love your website!!!! I just signed up for the newsletter last night. I can’t wait to find out what my guardian stone is!!!! I also ordered your book last night! I can’t wait to read it!!! Glad you have found me Amanda and that you are enjoying all the info. As I personally have always used the Copper or Gold Plated Copper Pyramids that is what I mostly talk about. I have heard from those using the raised Gold anodized Aluminium ones that they also work well for people. Gold is highly conductive like Copper. It really comes down to personal preference and what makes most sense for you. I think it can be placed anywhere that you will find it easy to get to and use. Appreciate the article. My wife recently became interested in this topic. She really wanted a pyramid, but after looking at prices of some she couldn’t get one. Im fairly creative so I made her one myself. The 3D frame is all copper wire, with an aluminum wrapped cardboard base. It looks ok for handmade, with what I had. Do you think this will serve the same purpose? Hi Isaac, yes you can absolutely make your own if you are good at that but I would make sure you are using the angles of the Great Pyramid or Nubian ones. My first one was handmade by someone online with copper pipes and wire. Hi Isaac, my husband made me a copper pyramid yesterday, as they are a bit expensive. I left some crystals in over night and in all honesty, I can’t feel much energy coming from them [compared to using sunlight in the summer], it is angled to the north by compass, should I have blessed it or done something to start the charging process? I joined your newsletter yesterday and downloaded your book. I have a question. Since real moldavite is so powerful, is it okay to cleanse it with a copper pyramid? Will the moldavite destroy the copper pyramid? If it is okay to do this, should moldavite be the only rock in the pyramid, or is it okay to put other crystals in the pyramid along with the moldavite while cleansing it? Thank you! I don’t believe so. I have cleansed Moldavite in my Pyramid and had no negative experiences or problems. Well, my copper pyramid came in, and until I get the compass (Lensatic 360), I’m using this old compass that I have, which is probably not that accurate. I sure hope it works! Hello Ethan I bought metal pyramid to cleanse and charge crystal and it seems having effectiveness all over my crystal…is there any change from the copper one? 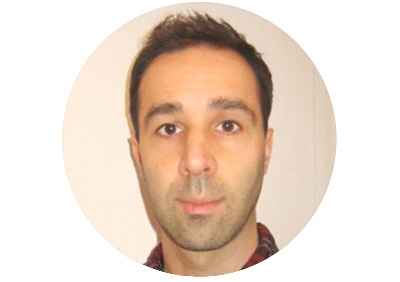 Hi Gennaro, I am not sure what you mean. I personally use Copper but some people make pyramids from other metals coated in gold which is also conductive to energy. If my pyramids is at an angle of 52, does it work? Does it make a difference in intensity of energy if the pyramid pipes are loaded with clear crystals? The angles in the Great Pyramid and Nubian styles are the most effective but I think any pyramid has power and will work to some degree. Yes, quartz would enhance it but it really is not needed. A regular Copper Pyramid works and works well. It is a personal choice. I have a triangular based pyramid. Can I use this one with my crystals? How do I align it with the cardinal points? It is not techically a pyramid, it sounds like a tetrahedron. I have not not heard of anyone using that to cleanse crystals so cant say.